April 07, 2012 in "japan"
Today I completed a task that I've been attempting for six months. Now you might think --logical readers that you are-- that purchasing a basic kitchen device in the land of futuristic electronics should not have been a half-year quest. Indeed, a stroll through any electronics store would reveal a multitude of promisingly shaped food heating devices. Since a typical Japanese kitchen will boast a hob but no oven, microwaves are big business. Walking from one end of a shop's kitchen utilities floor to the other will take you from the most basic food heating box through to full portable steam ovens capable of cooking everything from bread to roast chickens. What I was after was something in the middle of that range. I was no master chef, disappointed in my inability to produce seven tiered cakes as bribery to the snow gods (although with still no break in the weather, I was more seriously considering it). I just wanted to re-heat food and maybe cook a pizza or bake a handful of cookies from time to time. In short, what I wanted was a convection microwave. While I wasn't able to read the majority of the descriptions beside each device, it was fairly easy to narrow down the aisles of black boxes to the ones focussed on the product I had in mind. Familiar brand names such as Sharp, Panasonic, Toshiba and Hitachi met my eyes, known world-wide for exactly these microwaves. Whipping out my phone, I made a note of several promising serial numbers. Back at home I planned to google each one, grab their English manual and check out the reviews on UK and North American sites. Easy no? After all, there was surely NO WAY that ALL THESE MICROWAVES, manufactured by international companies, were ones SOLELY FOR THE JAPANESE MARKET? With not a single one of them having an ENGLISH INSTRUCTION MANUAL? … I think you can tell the way this went down. If you feel this is truly unbelievable, try google on the 'Sharp re-s204' or 'Panasonic ne-s264'. It turns out these companies are all secretly Japanese and do not offer any of their home country selection anywhere else in the world. Who knew? You can't even write 'Sharp' in kana, the Japanese phonetic script. It would have to be 'Sharupu'. Yet, it is a closeted Japanese corporation. So completely unlikely did I find this entire situation that I kept re-trying and searching for different brands and models. For six months. So when I tell you it can't be done, be assured that this was a thorough investigation. I even looked at pictures of the microwaves available in Europe to see if the model number just changed because the front panel was printed in Japanese. A cunning idea, but unyielding in its productivity. The problem was that with the more complicated microwave ovens, I strongly suspected I needed an instruction manual I could read. If I was happy with something that just required a time to be set I could certainly manage, but without access to an oven, I really wanted something more advanced. 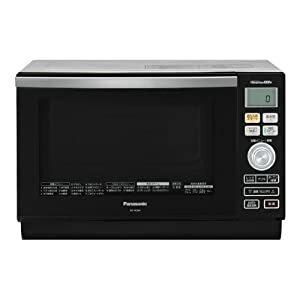 In the end --after realizing that the snow was never going to stop and hot food would be needed year round-- I searched for the simplest design and alighted upon another Panasonic model with a grill, oven and microwave function. Most notably, this microwave had an amazon.co.jp review from a foreigner who said he could manage it without being able to read the instruction manual. I clicked 'this review was helpful' and hoped I wasn't foolish to place my faith in a man named 'Raymundo Jr'. Also encouraging was a translated review on a second site which stated that it was so easy to operate, it could be managed by the elderly. I remain hopeful that the quality of the translation had no baring on the un-pc nature of that remark. That settled, I showed it to my parents who had offered to buy such a microwave as a Christmas present. Christmas… Easter … it's very easy to get these Christian holidays confused. However, when they tried to buy the microwave, their credit card was refused. This is quite clearly because SECRET JAPANESE MICROWAVES ARE NOT FOR FOREIGNERS. I put down my own (Japanese) credit card. They have responded by declaring the item is not yet ready to ship. If I emerge from the likely secret service investigation with a microwave, I'll let you know. Else, I'm putting a BBQ on my balcony.